There are many books on ADHD. These cover the nature of the disorder in general, how ADHD plays out in specific groups or settings (women, at work, in relationships, etc. ), and self-help. Simply typing "ADHD" into amazon will give you a wide selection. The following are the books I have found most enlightening. All are available from Amazon.com. The Mindfulness Prescription for Adult ADHD by Lidia Zylowska - Mindfulness is a hot topic these days, as well it should be. Mindfulness, the practice of engaging with oneself and the world in a thoughtful, self-aware, and purposeful manner, has shown benefit in a great variety of psychological ills: depression, anxiety, personality disorder, pain and stress management, and now ADHD. This book describes an 8-step program to incorporate mindfulness into the life of the ADHD sufferer. The author has performed research on this method and has found it quite effective in reducing ADHD symptoms. This matches my experience working with patients. Those who practice mindfulness meditation and incorporate the practice into daily life generally find a reduction in symptoms. Driven to Distraction by Ned Hallowell - One of the first "hey-that-book-just-described-my-entire-life-to-a-T" books, this classic presents ADHD through a series of narratives about various individuals with the disorder and the troubles they face. A good beginner's guide. 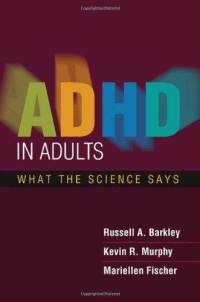 ADHD in Adults: What the Science Says by Russell Barkley - Russell Barkley knows ADHD better than anybody and I find this book to be his opus. It's pretty dense with data, graphs, and tables, but it's one of the few books that takes our understanding of ADHD beyond the simplistic. If you can get through the science, it will offer you a more nuanced view of the disorder. Taking Charge of Adult ADHD by Russell Barkley - a good book with ideas (some general, some specific) about getting a better handle on things. There are many such books out there, but this is among the best. My personal belief is that one needs some of the discipline that comes from mindfulness (see above) in order to really make these work, but others may find they are more ready to incorporate the techniques. Getting Things Done by David Allen - describes a system for organizing all the tasks in your life. The book has been very popular and many people swear by the system. I have mixed feelings about this book. While apparently a successful system in general, my patients' reactions and track record with it suggests to me it may not be as useful for people with ADHD. Peak: Secrets from the New Science of Expertise by Anders Ericsson and Robert Pool - Not technically a book about ADHD. However, it describes the steps that are involved in improving oneself in a general way. These can be applied to mental performance with good effect and those with ADHD could certainly benefit from the soft of training described in the book.